This article is about the Covenant anti-aircraft gun. For the Halo 5: Guardians multiplayer map, see Tyrant (level). The Type-38 Anti-Aircraft Cannon (T-38 AAC), nicknamed the Tyrant, is a large anti-artillery emplacement firing devastating bolts of superheated plasma at high velocities. The Tyrant can engage atmospheric craft in the air defense role and may also target starships in-orbit for planetary defense. Manufactured at the Assembly Forges, the Type-38 has been employed in the military forces of the former Covenant, its remnants, and even in the service of the human Venezian militia. Several Type-38's were used by Covenant forces during the Fall of Reach. At least two guns were deployed at Szurdok Ridge on August 12th, 2552. Both emplacements were dispatched quickly by NOBLE Team. 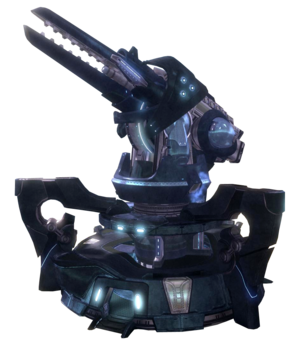 Two more were seen defending SWORD Base overlooking Airview Base after the Covenant had secured the area; both of these guns were similarly destroyed by NOBLE team member SPARTAN-B312. By early 2553, Insurrectionists on Venezia had acquired a number of these cannons, likely from a group of Kig-Yar operating in the Venezia sector. In January 2553, one of the cannons was fired on the ship UNSC Monte Cassino. The ship was able to evade, however, and used missiles to destroy the cannon. During the Battle of Draetheus V in 2554, Covenant commander Merg Vol surrounded his base with Tyrants. In 2557, Jul 'Mdama's Covenant made use of several Tyrants during the conflict on Installation 03. During the Battle of Ealen IV, Paul DeMarco and his fellow Spartans of Fireteam Bailey captured a Tyrant to cover the escape of a delegation of human, Jiralhanae, and Sangheili leaders. The T-38 AAC differs considerably from the more sleek Type-27 Mantis. It is significantly heavier in construction, and as such is more difficult to transport and deploy, though its firepower is generally considered to make up for these disadvantages. The weapon is able to fire three bolts in a rapid succession before cooling down. Unlike the unprotected observation balconies of the Type-27 cannon, the Type-38's heavy base structure effectively doubles as a covered defensible fortification. The base structure has two levels, with a small command center on the first level, with sloped ramps leading to the second level which serves as an observation platform. Each time the cannon fires, a bolt of plasma is generated in the core and fired up into the gun. The gun's vulnerable pinch fusion reactor is encased in a shielded power core in the center of the base structure. Destroying this will cause the gun to explode. Alternatively, the back of the cannon is fatally vulnerable to heavy weapons fire, such as the M808 Scorpion's 90mm main gun or the Type-26 Wraith's plasma mortar. To prevent this, the Covenant will assign a detachment of infantry and armored vehicles around the battery. The Type-38 "Tyrant" AA Plasma Cannon, with infantry guards around its base. Alternate in-game preview of the Type-38 "Tyrant" AAC in Halo: Reach. A Type-38 "Tyrant" on the surface of Reach. A T-38 Tyrant at Szurdok Ridge in Halo: Reach. A Type-38 "Tyrant" AAC destroying an oncoming fighter. A Type-38 Anti-Aircraft Cannon firing. The inner core of a T-38 AAC. Sarah Palmer fighting members of Merg Vol's Covenant inside a T-38 AAC. A T-38 "Tyrant" AAC encountered in Halo Escalation. A T-38 "Tyrant" being destroyed in Halo: Reach. A T-38 "Tyrant" firing at fighters in Halo: Reach.